Wing Chun Kun Fu vs. Tai Chi: Who Is Stronger? It just happened that I study couple of martial arts simultaneously, so people often ask me THE ULTIMATE QUESTION. Who is stronger? The elephant? Or the whale? 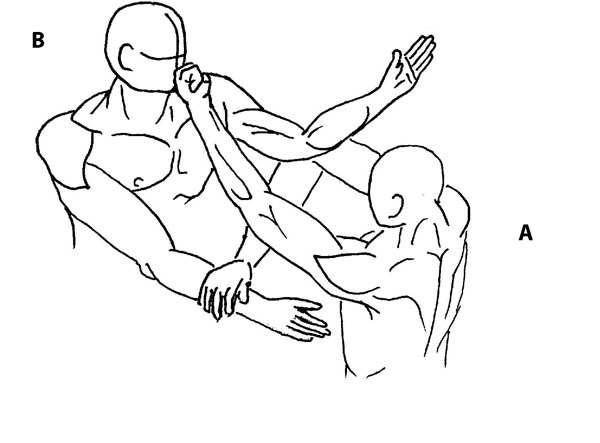 In this article I am going to go through a brief (it took me a long time to draw pictures though) typical (meaning, if they do not know opponent's specifics, they always do it) fight between Wing Chun and Tai Chi students. 1. They are at equal advanced level. In real life it means, that Tai Chi student is not slow and Wing Chun student can handle things outside the typical Wing Chun central line attack. 2. I don't care who wins. I love both styles and enjoy them. A handshake of a sort. Being agressive (yes, Wing Chun is one of the most agressive styles, and yes, it is a good thing), Wing Chun student launches a famous Jeet Kun attack, consisting, this time, of two punches in the face, with left and right fists, sequentially. Or with right and left - doesn't mater. As this is a pretty standard beginning for a Tai Chi practitioner, he does what he is supposed to do - drops his hands on top of opponent's hands, and a bit from outside. 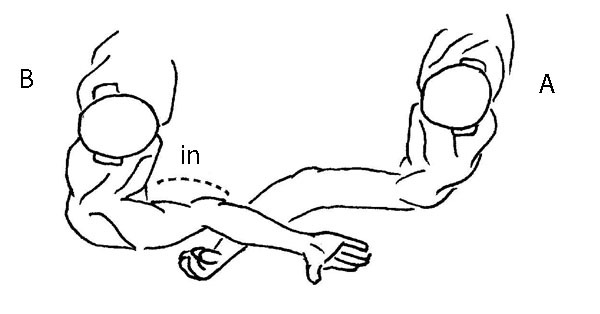 Tai Chi practitioner's hands are "in" (as opposed to "yan") in this position, and as for Wing Chun practitioner's hands, they are almost always "in", including the current situation. This is going to be our starting position, also, Wing Chun guy is marked as "A" and Tai Chi guy - as "B". ... push it away, and punch again. That is exactly what he is about to do. WC (Wing Chun guy's) right hand performs what is called Bon Sao block, controlling opponent's left hand with its elbow. 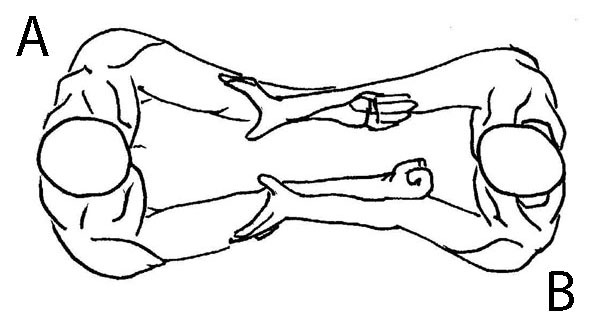 However, there is a nice extra twist to this Bon Sao: the palm of the same (right) hand slaps TC (Tai Chi guy's) right hand! As the result, WC'c right hand controls both TC's hands, and he can use his left hand to punch the opponent in the face. The image above shows what would happen, if WC succeeded. However, TC is still awake, and he does not want being punched in the face. So he does a "split", his right hand goes up by so called sagittal circle (I am going to use the terminology accepted by major part of Tai Chi community, I picked it up on seminars all around the country, and found it clear and descriptive. 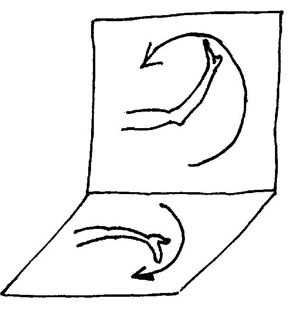 However, I do not know who created it, so I can not provide any references to the source), and his left hand going outside, by horizontal circle. As the result of this action, WC's hands are pushed away from each other, so he can not slap the TC's right hand, and technique fails. The situation looks very familiar to TC as well - it is called "upper hands". 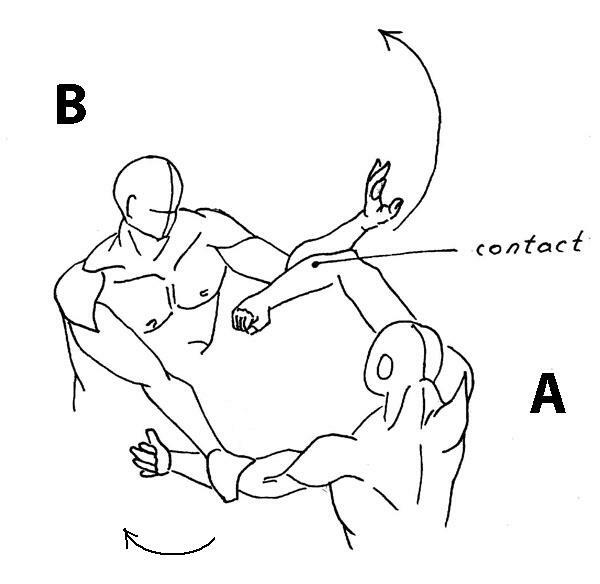 When you are in this situation, according to TC style of fighting, you need to move opponent's hands to make them "cross the limits". Let me explain. If TC tries to strike, he will fail, because WC's hands are on the way. However, if he pushes these hands away somehow - he will have a "clear shot". "Away" means "pass the limit", and there are two possibilities here. First limit is crossed, when the opponent's hand moves outside and crosses the line of opponent's shoulder. It is called a horizontal limit. 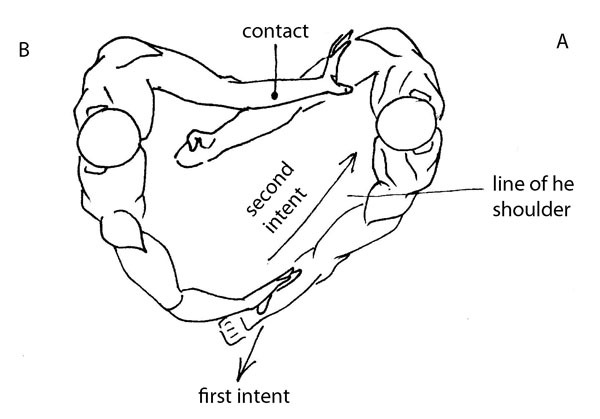 The second opportunity to strike is created, when the opponent's wrist crosses the vertical limit, by moving lower, than the opponent's elbow is. Out TC student chooses the first approach, and, by a circular motion (a horizontal circle again) he moves the WC's hand away from the central line. As I mentioned, he is not familiar with Win Chun style, and he does not know that moving their hands away from the central line is the surest way to make them hyper agressive. Here, by "first intent" I mean, that this is the first thing TC fighter is trying to do - to make WC's hand to cross the line of a shoulder. The "second intent" is what he is after... after. A punch in the face. However, as I mentioned, Wing Chun has its ways of dealing with people who push their hands off the central line. 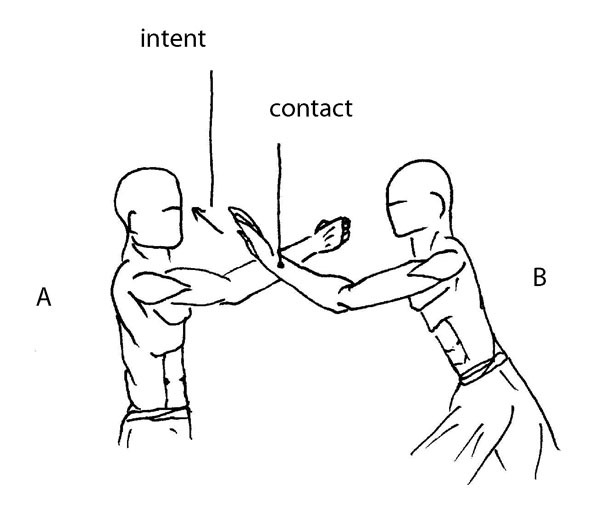 The left hand (one being pushed away) accelerates, intending to move around a pushing hand of TC, and ("second intent") to do a very predictable "punch in the face" thing. 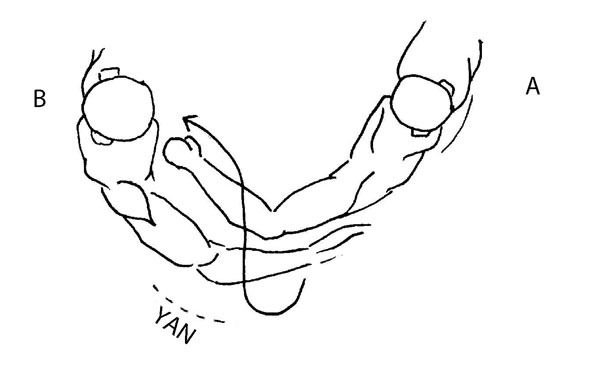 However however :) TC has a very well developed set of reflexes for this, and as soon as opponent's hand tries to break the contact, while being outside TC's shoulder line... Well... it calls for "changing from "yan" to "in". I will discuss "in" and "yan" hands in an advanced tutorial, let's just say, that now TC's elbow is INSIDE, towards the central line, while the fingers are pointing OUTSIDE. His hand, therefore, is still on top of WC's hand, so WC failed to deliver the "punch in the face". TC's hand is busy now, and therefore, his "punch in the face" is not delivered as well. And so on. My point is, it does not mater what style you practice, the winner is the one who does it better. The first one to make a mistake - looses.